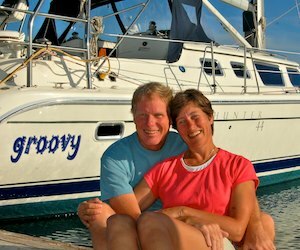 Cruising Mexico - Fixing your boat in exotic places!! Cruising = Fixing your boat in exotic places! March 2, 2013 – Outboard engines these days are equipped with a fail-safe mechanism for when you accidentally hit something while the prop is spinning. A little rubber hub inside the prop rips, saving the prop and engine from self-destructing, but disabling the prop from ever turning at full speed again. Suzukis are especially sensitive. Sigh. Mark fixed the problem by drilling 3 holes in the prop to affix it to its mount permanently. But the screws sheered. Double sigh!! So in Zihuatanejo we went in search of a welder. Local folks pointed us in all kinds of directions with great recommendations for this guy or that, but in the end our cabbie chose our guy, since he’d never heard of any of the welders on our list. He drove us way out of town, dropped us off in front of a shop and vanished. There we were, prop in hand, standing in front of a row of mechanic shops, in the middle of nowhere. Part of cruising Mexico is learning to describe mechanical problems in Spanish. Not easy! But some sign language, lots of turning the prop in our hands and pointing, a few trips up and down the row of shops — all accompanied by our halting Spanish and their halting English — finally got us to the right guy in the right shop. But did he really understand what we were talking about?? The prop was placed in a vice and the drill came out. Suddenly a second guy showed up and a shower of Spanish ensued. Mark was whisked away in a car to a Tornillería (a screw store) a few miles away. “Cruising” means going with the flow and having infinite faith that all will work out. 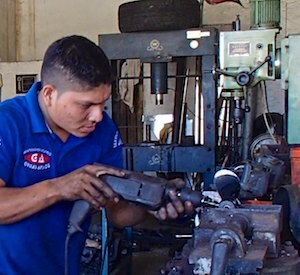 Twenty minutes later, after the shy, young mechanic and I had exhausted the limits of my Spanish conversational skills while we perched on his bench, Mark returned with three enormous stainless steel hex-head set screws — hopefully impervious to sheering. The holes were tapped, the screws installed, and the repair was completed for 200 pesos ($16 USD). The work was superior. One of the unique things about this cruising life is that rather than being mere sightseeing tourists, we usually go to town with a purpose and a mission. Having faith and allowing fate to take us by the hand and lead us to our destiny (and destination) has been one of the great lessons we have learned.